Check this blog each Sunday for the latest coupons from Michaels, Jo-Ann, Hobby Lobby, AC Moore, and current promotions from CTMH and Scrapbooking Sue. You can print the coupons below, or visit the link to the coupons HERE. 15 stamps for only $5.00! Find out more HERE. $5 Stamp of the Month! Celebrating the 5 year anniversary of Studio J digital scrapbooking, 2-page layouts are only $5 this month! PLUS, there are 5 ways to win a FREE CTMH D-ring album! For more information, please go HERE. $5 layouts and 5 ways to win! The Pathfinding layouts are now available! Receive FREE PDF e-files for 4 scrapbook layouts. 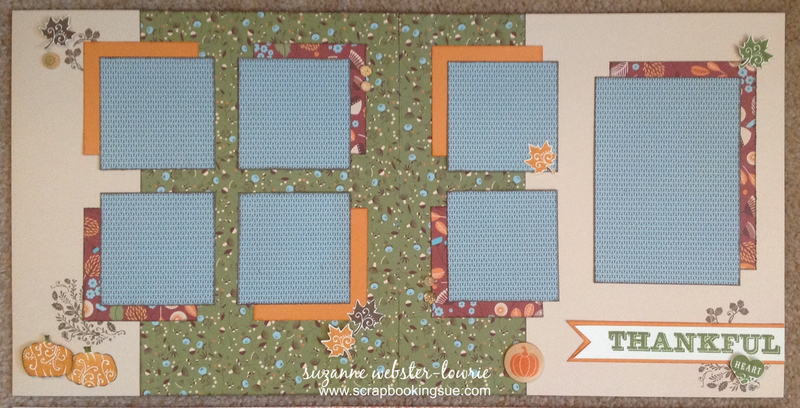 When you purchase the Pathfinding Workshops on the Go Scrapbooking Kit from me, I will send you the files to “stretch your workshop” and create 4 additional layouts from your kit! Please go here for all of the details. FREE PDF e-files for Pathfinding Scrapbook Layouts! Receive FREE PDF e-files for 4 scrapbook layouts! I designed this program to give you added value for your Workshops On The Go purchases. Get more out of your workshops and supplies by utilizing this FREE program, which includes: complete cutting guides, directions and instructions, and full color artwork pictures for making additional scrapbook layouts. For more information, please go HERE. “Lucky 5” Studio J Contest! NEW Pathfinding “Stretching Your Workshops” Program! I have a brand new “Stretching Your Workshops” program ready to go!!! 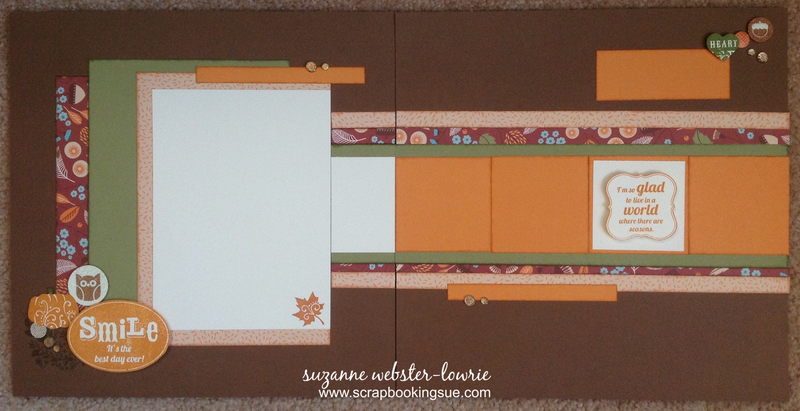 Would you like to get more out of your Workshops On The Go (WOTG) Scrapbooking Kits? If so, then the “Stretching Your Workshops” (SYW) Program is for you! This program is completely FREE for those that purchase/have purchased the Pathfinding Workshops On The Go Scrapbooking Kit from me. What is the “Stretching Your Workshops” Program? The “Stretching Your Workshops” Program was designed to get more out of your pre-purchased Workshops On The Go (WOTG) Scrapbooking Kits by Close To My Heart. This program does not substitute for the WOTG layouts themselves, but rather complements them by using up some of your remaining papers and supplies! With this program, you will now create 2 additional layouts (4 pages) and still have leftover paper pieces for smaller projects, such as cards. Usually, 2 additional pieces of neutral colored paper are required as base pages, but NOT with the Pathfinding SYW Program… the WOTG kit contains all of the papers you will need to make 3 complete scrapbook layouts! I LOVE to see people get the most from their products, and I am hoping that this program will help! I have created a 20 page color guide for you! The program includes instructions and tips, FAQs, a guide to paper and color matching, an 11 page cutting guide for each paper used, and pictures of completed artwork to be used as a guide for assembly. To get your copy of the Pathfinding “Stretching Your Workshops” Program emailed to you as a PDF file, simply order your Pathfinding Workshops On The Go Scrapbooking Kit on my CTMH shopping site HERE, and then send me an email requesting your files! It’s THAT easy! If you are a CTMH consultant wanting to use this program in your own business (i.e. customer workshops), simply place a $30 order on my OBA for ANY products you choose, and then email me a request for the Pathfinding PDF e-files. 1 – My Acrylix Pathfinding Workshop Stamp Set (D-size) *EXCLUSIVE to this kit! Acrylic Blocks for the stamps, paper trimmer, scissors, adhesives, foam tape or pop dots (optional). If you have any questions, please email me. I am always happy to answer your questions! 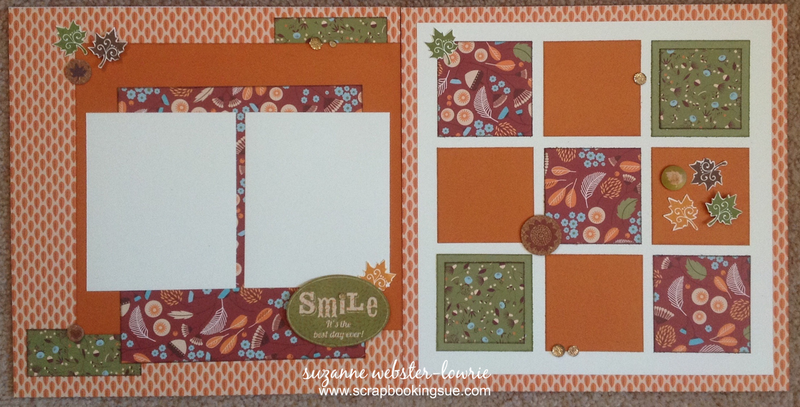 The Pathfinding Workshops on the Go Cardmaking Kit has an abundance of supplies to make 15 fall / Thanksgiving-inspired cards! The full-color instructional brochure contains cutting guides, artwork, tips and tricks, and more. 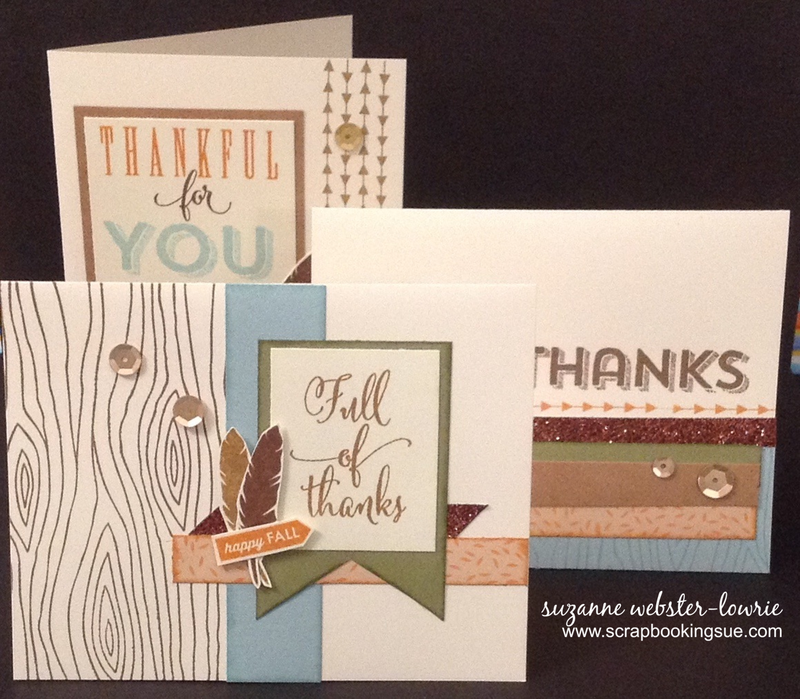 Talk about a quick and easy way to get all of your Thanksgiving cards made in a snap… with all of the color matching and designs done for you! Simply follow the step-by-step instructions to make the cards exactly as shown, or change it up and put your own spin on the designs. Either way, they are a blast to make and to give! When you place an order of any amount on my CTMH shopping website this month, I will send you one of these finished cards (and matching envelopes) as a THANK YOU from me! The card will be blank inside, so feel free to send it to someone that you are thankful for this month. There are 15 cards in this kit, so this offer will be available for the first 15 people who place orders with me online, here. Thank you for your business, and for supporting this blog! Use the materials, accessories, exclusive D-size stamp set, and instructions in this kit to create 15 beautiful cards (5 each of 3 designs)! You will need to supply your own scissors, glue, and inks. There’s still time! FREE Halloween Custom Scrapbooking Workshop! 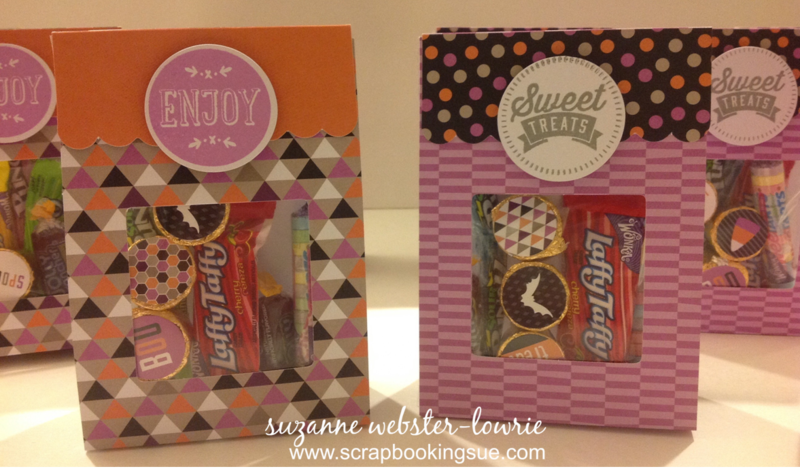 The other day, I shared these gorgeous little Halloween Treat Bags from Close To My Heart. Well, last night I packaged up some more goodies and couldn’t help but share one last look at these before Halloween is over for the year! The last time I featured these bags, they were filled with candy corn. As you can see, these bags have a variety of different candies inside. I also made sure to use some round candies, so that I could attach the cute Halloween stickers that came in the treat bag kit! Here is a closer look at the stamping that I did on the bag toppers. The treat bag kit comes with the circles, all I had to do was stamp my sentiments. 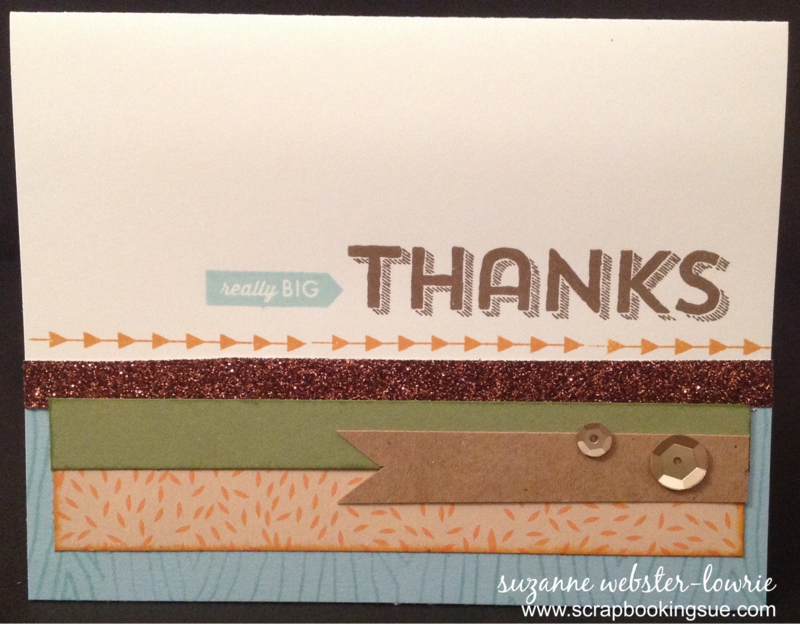 I used the “Sweet Salutations” stamp set for the sentiments, and Thistle and Slate inks for stamping. To learn more about the Cut Above Halloween Treat Bag Kit, please click here. Or, if you would like to get a jump on the Christmas / Holiday season, check out the Cut Above Holiday Treat bags here! They would make great gifts for stocking stuffers, teachers, co-workers, Girl / Boy Scouts, sports teams, and more! The Close To My Heart Blog, Make It From Your Heart is having a very clever contest going on right now! The “Spooky Crafting Adventure” Contest begins with a little game, and eventually leads you to a crafting challenge. With cute Halloween riddles and “dilemmas,” you will surely get a kick out of playing! It only takes a couple of minutes and then the real fun begin… your spooky crafting adventure! At the end of the game, you will receive a crafting challenge that you are to complete and submit by October 29th. The 5 winners will be announced on October 30th, 2014 on their blog. So, what are the prizes? The Cut Above Treat Bags or Card Kits! You can view my posts about those here, here, and here. To find out more information, or to get started with your Spooky Adventure, please visit their blog here. Quick and Easy Halloween Treat Bags! Are you looking to give something a little more special to family, friends, or children this Halloween? These Halloween treat bags are an elegant, yet fun way to share Halloween treats this year! And, they make wonderful TEACHER GIFTS! 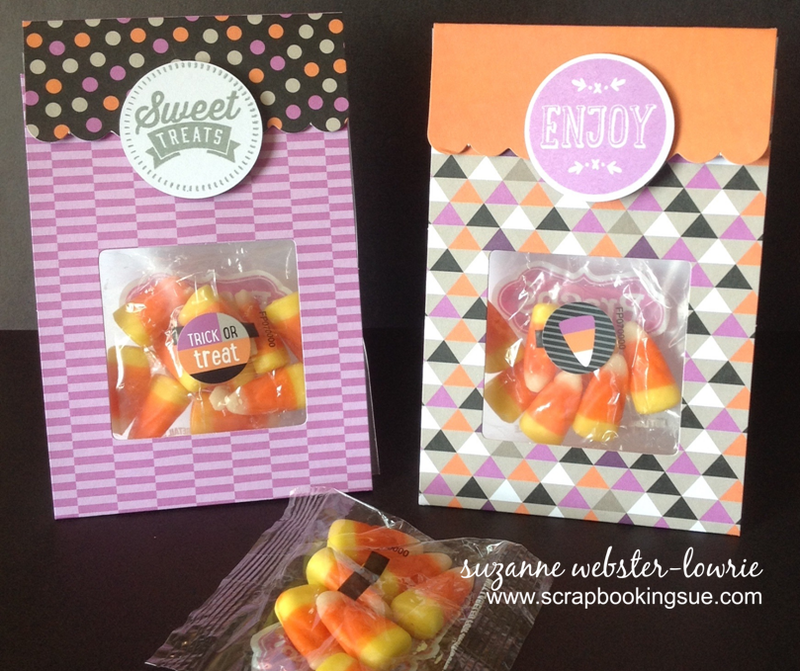 Although I have made my treat bags with candy corn, they can also be made with any small, round, individually wrapped candy. In fact, the stickers that come in the pack are perfect for attaching to small candies! Here are a couple of pictures of the treat bags (notice the candies and stickers in the first picture). The second picture shows all of the contents from inside my bag. There is enough product here to make 10 treat bags! 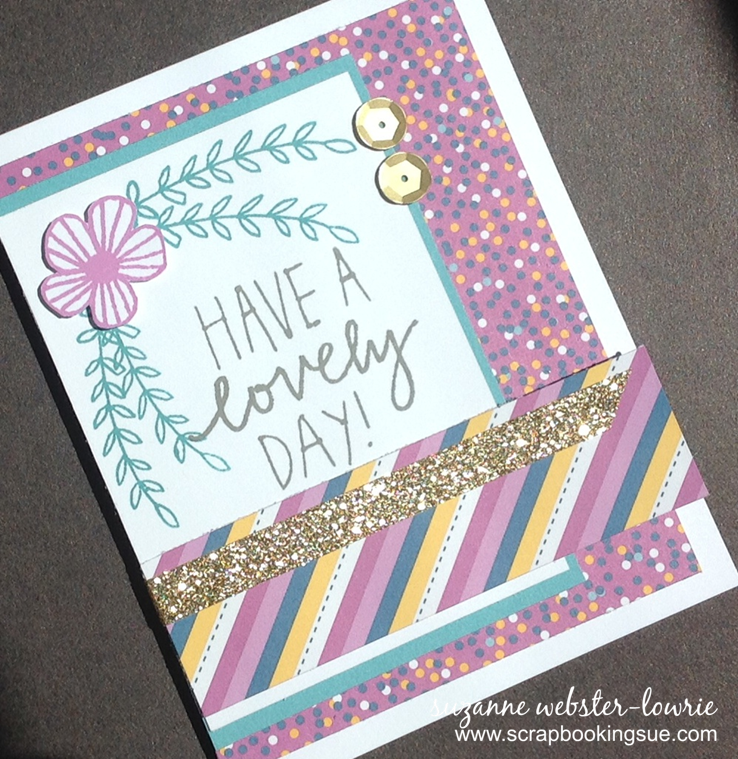 The “Enjoy” sentiment was stamped with Thistle ink onto one of the White Daisy cardstock circles from the kit. I even received adhesive-backed foam squares to mount my sentiments onto the bags. 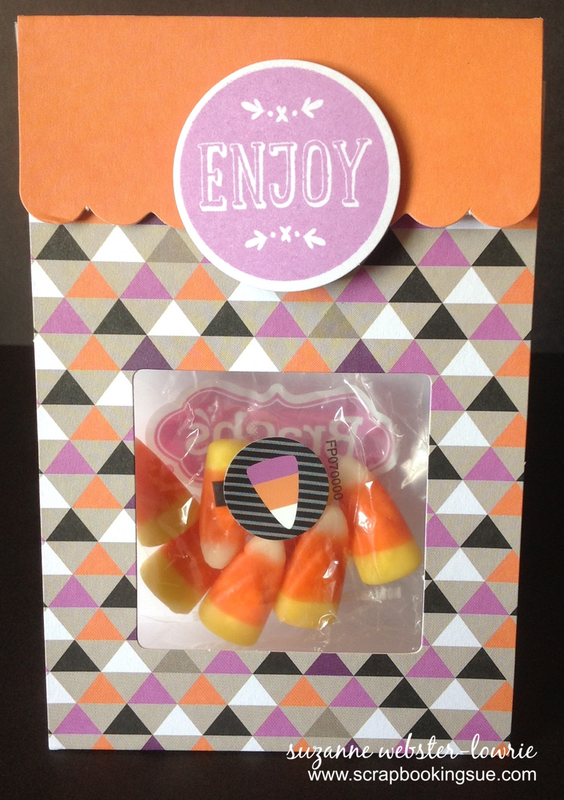 I placed a candy corn sticker onto my candy corn package for another burst of color! For the next treat bag, I stamped the “Sweet Treats” sentiment in Slate ink onto the circle. Again, I adhered it with foam tape to “pop” off the bag, and placed a “Trick or Treat” sticker on my candy corn bag. Halloween will be here before you know it! 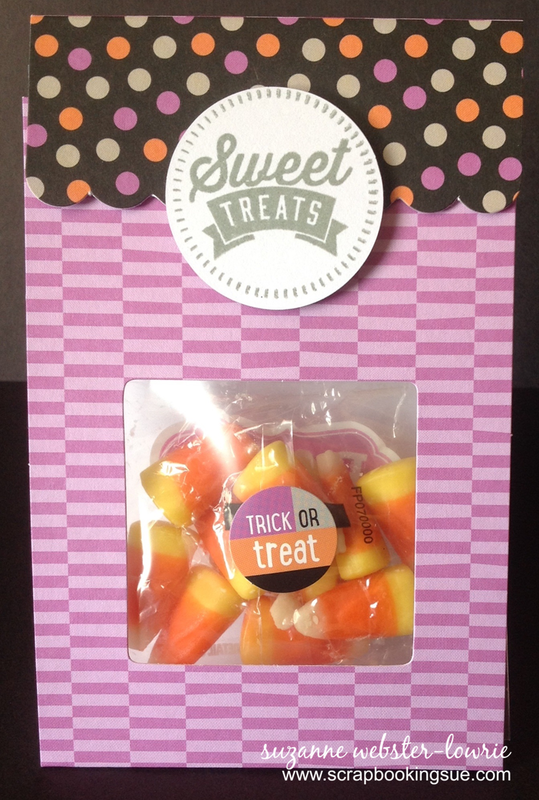 Make sure to order your Cut Above Halloween Treat Bag Kit today, so that you receive it in time for Halloween! Set of 4 Cricut-compatible stamps (coordinates with the Art Philosophy Cricut Collection). The Confetti Wishes cardmaking kit comes with enough product to make 10 cards – 5 each of the 2 designs shown. All of the papers are pre-cut and pre-stamped (unless you add on the stamp set, in which case, you will receive extra paper to stamp your own images). All you have to do is some minor image cutting, assemble, and your cards are ready to go! 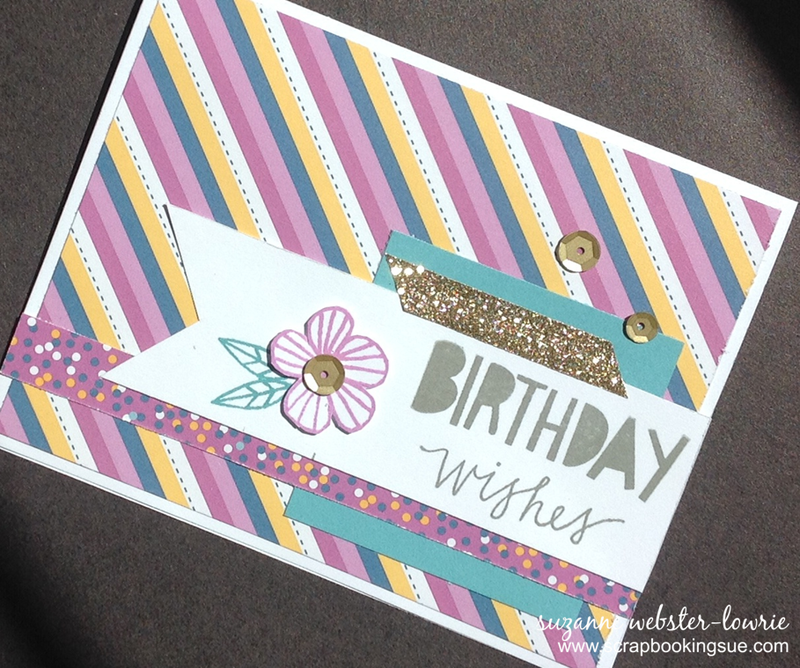 Just think how quick and easy it will be to create 10 birthday and all-occasion cards… handmade by YOU! For more information about the Confetti Wishes Cardmaking Kit, including supplies, prices, and more, please click here.